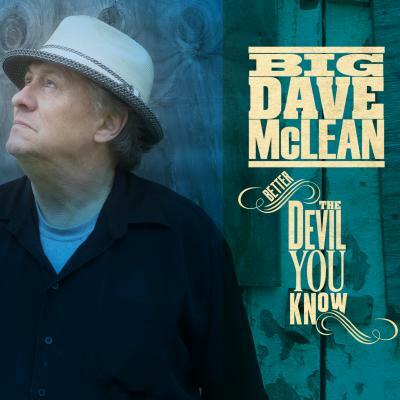 Better the Devil You Know, is the new CD from acclaimed Canadian blues and roots musician Big Dave McClean. The new album was produced and mixed by Steve Dawson and recorded at the label’s Henhouse Studio in Nashville. Joining McLean (vocals, harmonica, acoustic and National steel guitar) are Steve Dawson on a host of guitars, banjo, pedal steel, mandotar and dobro; Kevin McKendree on keyboards; Gary Craig on drums; John Dymond on bass; Fats Kaplin on fiddle and mandolin; and Ann and Regina McCrary on backing vocals. Juno-nominated blues legend Big Dave McLean swears he didn’t set out to make an album with a theme. But there are a lot of spiritual references on Better the Devil You Know. From gospel-tinged blues numbers to tributes to dearly departed loved ones, the songs on this album betray Dave’s roots as the son of a Presbyterian minister – while also giving the Devil his due, figuratively speaking. There’s a righteous cover of Blind Willie Johnson’s gospel tune, “You’re Gonna Need Somebody on Your Bond,” that sees Dave rocking out on harmonica. An original entitled “Talk About a Revelation,” inspired by the mass shootings in Paris, finds Dave singing in impassioned tones about a day when people work together for peace. “Swinging on Heaven’s Gate,” is a mandolin-sweetened gospel country number that Dave wrote back in 2000 after the deaths of his father and close friend – the latter a hell-raiser who Dave envisioned literally swinging defiantly on the pearly gates. And then there’s “Deep Down in Florida,” one of two pure Delta blues songs on the record. A cover of a classic song by Dave’s musical hero, Muddy Waters, it was the favorite of Dave’s late bass player, B.B. Gordon. Better the Devil You Know also features two Steve Dawson-penned homages to deceased southern bluesmen: “The Side of the Road,” about the mercurial Delta bluesman Skip James, juxtaposes earthy banjo against blistering electric guitar; while “Angeline,” a country blues tune about the aforementioned Blind Willie Johnson, laments Johnson leaving his wife with nothing but the blues. On a more “agnostic” note, Dave delivers a swampy, gritty, and downright rip-roaring original called “Where the Music Comes From,” inspired in part by his visit to Clarksdale, Mississippi, a few years back with a film crew making a documentary about him. He includes a cover of Johnny Shines’ “Pet Rabbit,” recorded in the 30s-style recording booth at Jack White’s Third Man Records in Nashville. And Dave also gives another nod to his hero, Muddy Waters, with a heartfelt rendition of “Can’t Lose What You Ain’t Never Had,” featuring the brilliant Kevin McKendree sounding like a reincarnated Otis Spann on piano. Better the Devil You Know sees producer Steve Dawson pushing Dave far beyond his Chicago and Delta blues roots and into country blues, southern gospel and Americana. He captures every gravelly, weathered note of Dave’s rough-hewn vocals like a cabinet-maker captures the beauty of distressed wood. It seems fitting that such A-list talent should come to the service of Big Dave McLean, the man often viewed as an unsung hero of Canadian blues and an inspiration to younger generations of musicians such as Colin James. Ever since getting his start with an impromptu guitar lesson from John Hammond at the 1969 Mariposa Folk Festival, this Yorkton-born, Winnipeg-based artist has been devoted to his craft, touring relentlessly through Canada’s blues bars, folk clubs and folk and blues festivals, even when it meant supplementing his income in the early days with all manner of side jobs. Along the way, there have been career highs: opening for his idol, Muddy Waters; earning two Western Canada Music Awards, a Prairie Music Award, a Whisky Award and countless Maple Blues honors – including the Blues with Feeling (lifetime achievement) Award; sharing a Juno (Canada’s Grammy) for his contribution to CBC’s Saturday Night Blues Vol. 1 album; and, most recently, garnering his third career Juno nod for his last album, Faded but not Gone. With Better the Devil You Know, Big Dave McLean continues to set an example for new generations of musicians by constantly evolving his sound, embracing new artistic collaborations and making records that just keep getting better and better. Join the Frugal Boomer to receive access to entire articles, article discussions and more!